Uzbek President Shavkat Mirziyoyev attends a wreath-laying ceremony at the Tomb of the Unknown Soldier, Moscow, Russia, April 5, 2017 (AP photo by Pavel Golovkin). 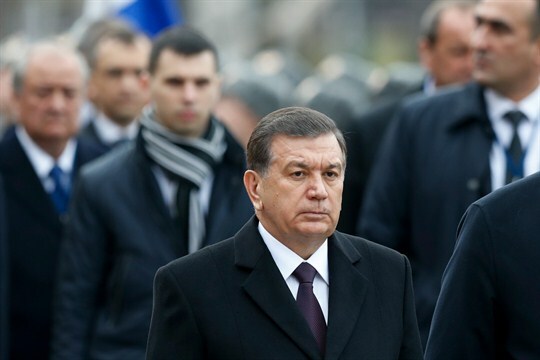 Last week, Abdulla Aripov, the prime minister of Uzbekistan, and Emomali Rahmon, the president of Tajikistan, agreed to allow their citizens to visit each other’s countries without a visa for up to 30 days, removing restrictions put in place between the adversarial regimes back in 2001. The move is the latest sign that Uzbekistan, one of the world’s most closed countries, is slowly opening up.